* AUTOMOBILE: Domestic sales of trucks and buses are likely to increase 9-11% in the current financial year started April owing to a positive demand outlook in most parts of the country. -Suzuki Motor Corp will fit premium cars sold by its Indian unit with lithium-ion batteries sourced from the parent's upcoming Gujarat battery plant, starting 2020-21 (Apr-Mar). * CORPORATE: National Company Law Appellate Tribunal has allowed some directors of Nirav Modipromoted companies Firestar International Diamond and Firestar Diamond to withdraw up to 100,000 rupees each per month for personal use. -Essar Ports, a unit of Ruias-promoted Essar group, is targeting to invest $70 mln for expansion at its Hazira facility by September 2020. 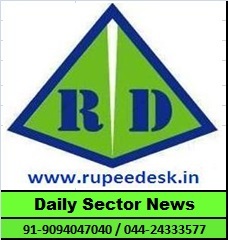 * ECONOMY: Reserve Bank of India on Thursday said state governments should improve their budgeting, especially on the expenditure side, to ensure sustainable growth and fiscal discipline. approximately 140 acres in the upcoming Navi Mumbai Influence Notified Area in Navi Mumbai. * MUTUAL FUNDS: KKR-backed homegrown financial services firm Avendus Capital has made a nonbinding offer to buy IDFC Asset Management Co for about 33 bln rupees.